Bliss is Extreme Happiness, or in our case… Happy Dogs! Happy dogs are what we are all about. 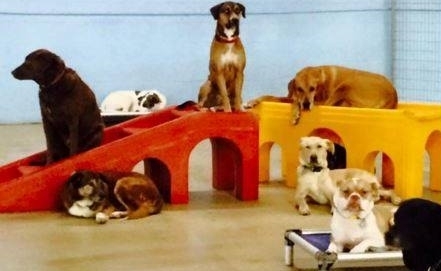 DogPhoria is a premier dog daycare and boarding experience. Our goal is for dogs to have fun while staying healthy & active. We provide dog daycare and boarding that gives owner’s complete peace of mind. As devoted dog lovers, we treat every one of our “guests” as if they were our own – like a home away from home! We are engaged owners with a dedicated, trained, and loving staff. DogPhoria is designed to be a cage-free environment that allows for maximum individual attention and all-day play. We are committed to providing the Atlanta area with a premier daycare and boarding experience, including bath services and state of the art web cameras to provide total peace of mind. At DogPhoria, we recognize that your dog is an important member of your family. Thank you for entrusting us with your four legged companion! Find us on your favorite social media site! Webcam — Watch us play! Peach on a Leash Dog Training & Behavior Services- We are very excited to be expanding our board & train program in a partnership with DogPhoria in Chamblee! Our campers will stay in luxury suites and will be immersed in a structured training program with multiple sessions each day. Just like all our board & train programs, you’ll receive regular video updates and join your dog for a transfer session at the end of the program. Please email your questions to us at train@peachonaleash.com. Daycare — Come Play and have a Fun Filled Day! Boarding — Man's best friend needs a vacation too!